Edge-emitting lasers (also called in-plane lasers), where the laser light propagates in a direction along the wafer surface of the semiconductor chip and is reflected or coupled out at a cleaved edge. Surface-emitting lasers, where the light propagates in the direction perpendicular to the semiconductor wafer surface. Figure 1: Edge-emitting semiconductor laser. Edge-emitting lasers are the original and still very widely used form of semiconductor lasers. Their resonator length is typically between a few hundred micrometers and a few millimeters. This is sufficient for reaching a high gain, so that an edge-emitting laser may lase even if the resonator losses are fairly high, e.g. when the end faces (edges) are not coated and there is only the Fresnel reflection of the semiconductor/air interfaces. 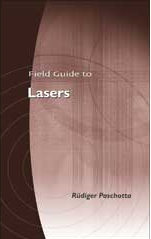 Within the edge-emitting laser structure, the laser beam is guided in a waveguide structure. Typically, one uses a double heterostructure, which restricts the generated carriers to a narrow region and at the same time serves as a waveguide for the optical field. This arrangement leads to a low threshold pump power and a high efficiency. Depending on the waveguide properties, particularly its transverse dimensions, it is possible either to obtain an output with high beam quality but limited output power (some hundreds of milliwatts), or (with a broad-area laser diode) an output with high output power (tens of watts or even > 100 W) but with poor beam quality.